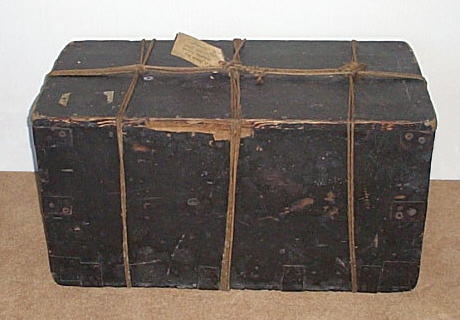 Webmasters' Note: This is a recent picture of Joanna Southcott's Box which is currently in the custody of the Panacea Society. The following information on the history of the box was written in 1929 by Mary Robertson, a followers of Joanna's and covers the earlier history of the Box. † An address to the Anti-Corn Law League from the London Southcottian Church. This year is particularly noteworthy as it witnessed the discovery of two letters of great interest written by the Rev. Richard Foley† in 1840, telling his Southcottian friends how family affairs had necessitated his opening, in the presence of his mother and brother, of the Box of Sealed Writings, and how each sealed bundle of MSS. had been carefully restored. A printed letter pointing out the importance of this discovery was sent round to the Bishops, and later to the Press. † Related to the present Bishop of London. This box was opened towards the end of April, by the doctor and his family in whose care it had been for many years. Having decided to take the risk of opening it, it was unroped and the lock forced. Among the 8½ lbs. of MSS. within, was found that wonderful dream of Joanna's of "The Boiled Bible"* with the beautiful Communication given her on it in April, 1806; also her prophetic dream in Sept. 1803 † of a bull-dog (England) with a cat (the French) furiously scratching at the inside of his throat (symbolic of the Straits of Dover): but the dog did not die - he swallowed the cat. †Napoleon was even then, although the "Peace of Amiens" was in force, silently massing his "Great Fleet" at Boulogne, for an invasion of England. † A man in California has recently declared that he himself faked this box and its contents.